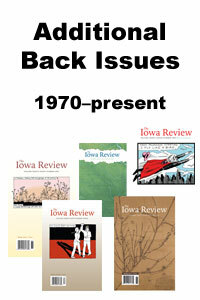 To view recent issues and their tables of contents, please visit http://iowareview.org/issues. To view older issues, visit our online archive at http://ir.uiowa.edu/iowareview/. To order an issue published before those featured in our webstore, please add this product to your cart and enter the volume and issue number of the issue you'd like in the "Comments" box during checkout (e.g., Volume 39, Issue 2).